Canada-based Sarah Richardson has been a favorite interior designer of Hello Lovely’s audience for many years, and after covering the first two installments in this series, we continue now with the remaining 50 decorating ideas inspired by her lovely home decor choices and fresh take on traditional interior design and country style. Part 1, and Part 2 are here! 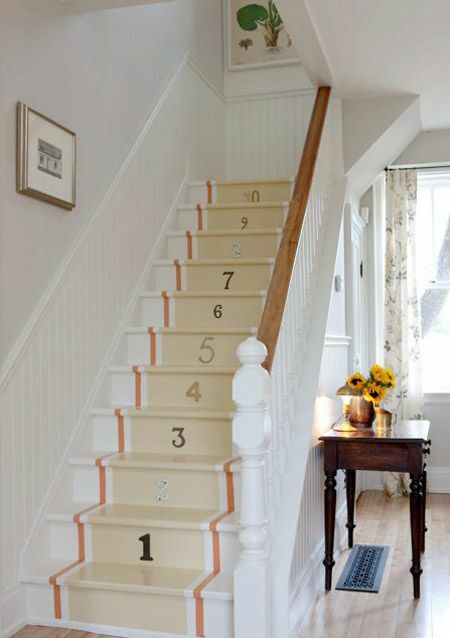 The whimsical way Sarah Richardson treated these stair treads is a lighthearted cottage style nod sure to please children of all ages, and it seems to me it will only get better with distress and age. My favorite Sarah Richardson designs are the tranquil, timeless ones like this bathroom she designed for her daughter in the family’s Ontario off-the-grid country house. It feels to me a little bit like bathing in a cloud, and I can imagine soaking in that gorgeous tub while dreaming gorgeous dreams. 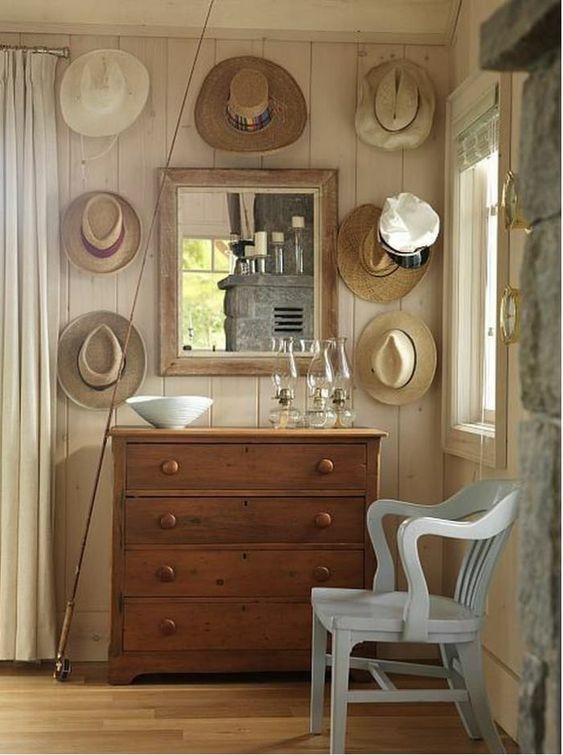 Hanging hats on hooks as visual interest and art may not be a new trick, but I especially love the look when it occurs in an area that makes sense to have hats hanging on the wall! Like this sweet country style spot in Sarah’s seaside cottage with whitewashed paneled walls with a vintage chest and blue painted banker’s chair. In Richardson’s daughter Fiona’s bedroom, a cheerful spring green on the walls combines with a beachy turquoise blue for a fresh take on cottage style. Instead of a matchy-matchy green solid fabric for the chaise in the bedroom, she opted for a whimsical bold print with deeper, more autumnal and wintry shades of green, and it’s so much more interesting this way! 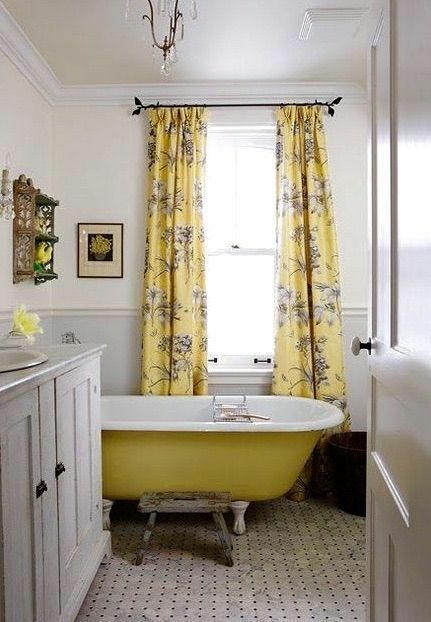 When you want to wake up to sunshine every morning, here’s one way to assure it can be yours: paint the side of your clawfoot tub in a cheery shade of lemon, and find a beautiful fabric for curtains you’ll never tire of. Who says you have to choose just one or two tiles for that bathroom design? Sarah combined at least four different tiles for the design in her daughter Robin’s bathroom. The turquoise blue color ties them all together, and the chevron mosaic in the shower which breaks up the subway tile is my favorite element of the design plan since it lightens the mood and feels like a beautiful beach towel I’d like to wrap up in. 48. Resist Urges to Refinish. This pink bedroom in a farmhouse with interior design by Sarah Richardson was pulled together with contemporary elements like the custom cherry blossom upholstered headboard and vintage ones like the little table and mirror. Sarah often leaves her fleamarket finds in their found state, showing age, wear, and patina (just look at the knobs on the drawers). You don’t often see a fabulous, luxurious bathroom like this one with mint green walls designed for Richardson’s daughter with such humble decor such as the vintage country desk and distressed blue stool. High end plumbing fixtures and marble tile are warmed and tempered with the humility and country sensibility of time-worn treasures. I’m a huge ambassador for aqua so I love that Sarah Richardson incorporates the color in so many of the spaces she designs. There are so many gorgeous watery blues and greens on the aqua spectrum, and aqua is such a tender, natural color of tranquility. Thank you so much for tuning into this series spotlighting Sarah Richardson designs! Nantucket Style Chic Design Inspiration & House Exteriors! Love the vintage country desk as a vanity. We used similar pieces for our master and powder room and we’ve been really happy with them! 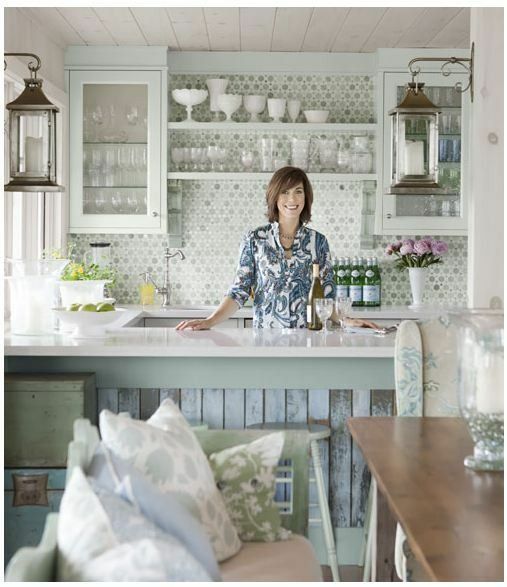 I so love Sarah’s interiors and have watched many, many of her HGTV shows. Thanks for the walk down memory lane with the photos of other homes she has designed in the past…I never tire of them! The full length drapes in all the rooms, including the bathrooms, not only adds that splash of colour but a certain elegance to the simple decor. I love it!